Bathrooms can be pretty utilitarian spaces, but adding a touch of the unexpected is always an easy way to shake things up. (Decorating, that is. 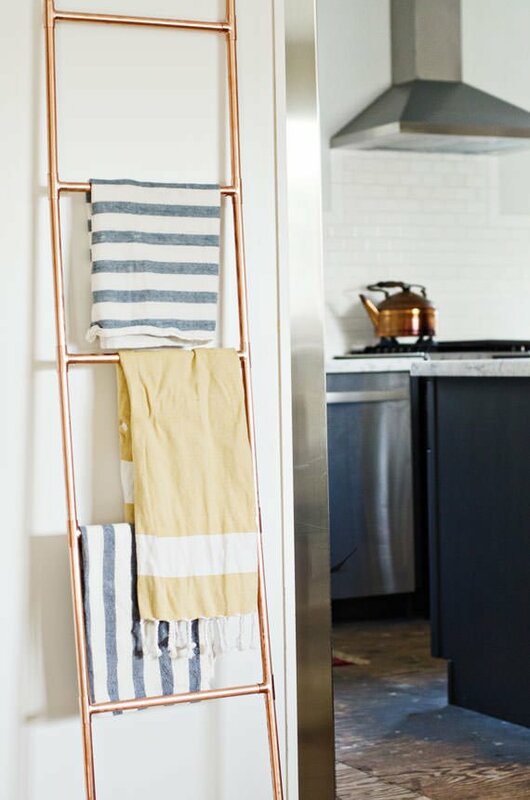 :)) Towel racks are something everyone needs, but instead of sticking with the basic chrome builder’s choice, try these DIY towel racks to add some character to what can otherwise be a boring (or expensive) room to decorate. 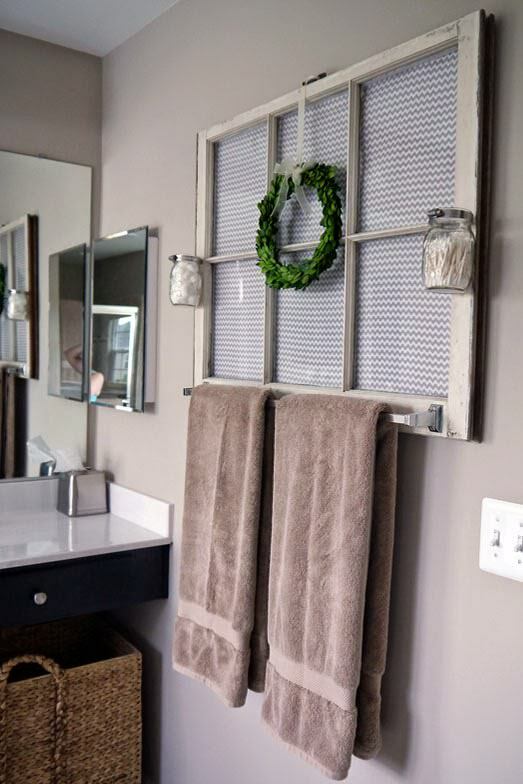 From ‘Lil’ Luna’, this DIY bathroom makeover included this old window towel rack they made by screwing the window into studs in the wall, then adding hooks to the bottom edge of the window. This is so charming, and easy! 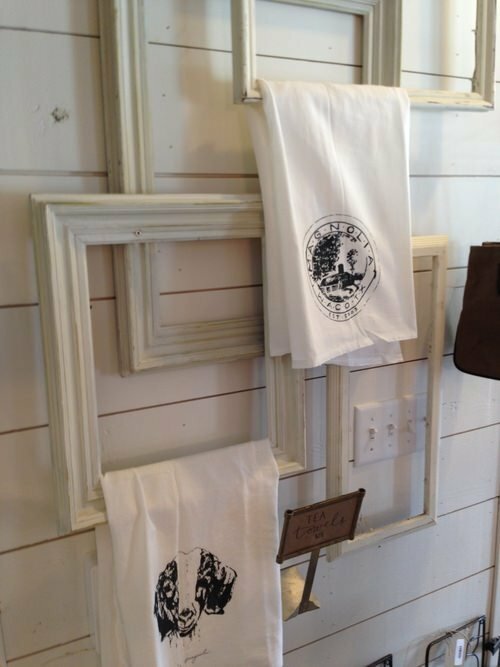 ‘Carley Kelley‘ took this shot of a towel rack at Joanna and Chip Gaines’ (HGTV) Magnolia Market. They are simply frames overlapped and attached to one another with screws, then attached to the wall. Clever and full of fun! 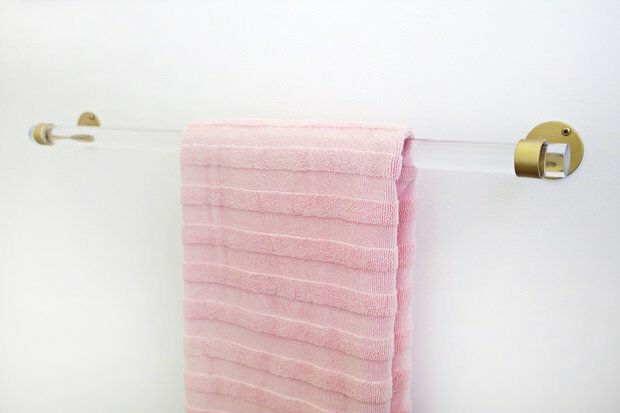 This DIY Lucite towel bar from ‘A Beautiful Mess’ is a perfect project for the glam in us… A little modern, a little metallic, and so pretty! Made from an acrylic rod and ceiling curtain hooks, easy! 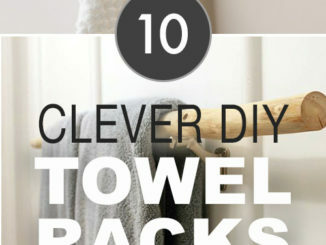 This is not a tutorial, but we think it’s a pretty simple DIY that we are wanting for our own! River stones, a wood plaque from the craft store and some copper piping. You would need a masonry bit to drill into the stone, and some Gorilla Glue or something similar. Don’t forget to weight or clamp the piece together as the glue cures. Photo by ‘Viva Terra‘. 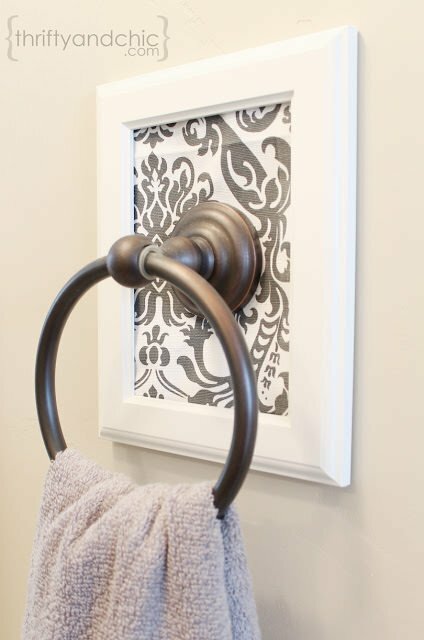 Alicia at ‘Thrifty & Chic’ updated her old hardware with a DIY framed towel holder. This project is simply a picture frame and some leftover fabric! Cute AND cheap! Ok, so you know we love projects that embrace nature. We just do. 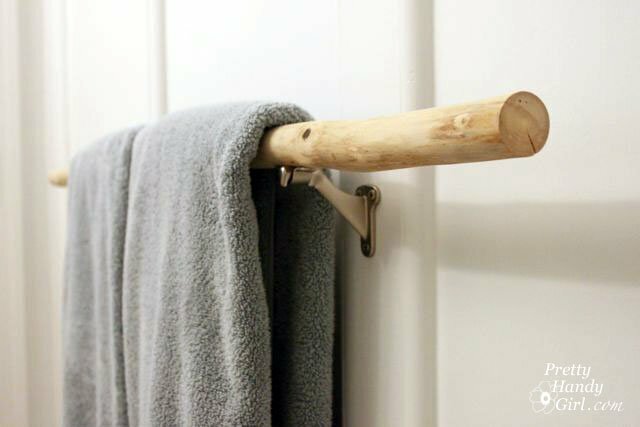 This DIY branch towel bar is such a conversation piece, but not in a “why is there a tree in your bathroom” kinda way. Great tutorial. You can get your hands on a branch, right? Come on! From ‘Pretty Handy Girl’. 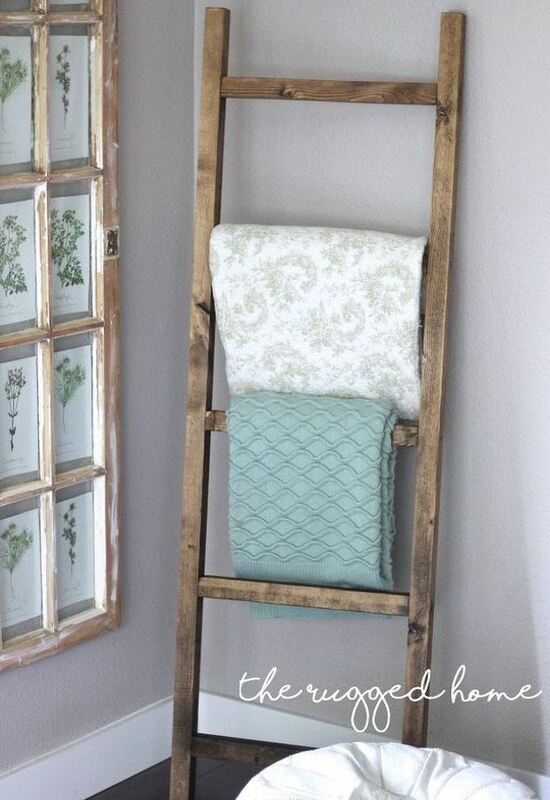 From ‘The Rugged Home’, this DIY rustic ladder rack cost only $7 to make. 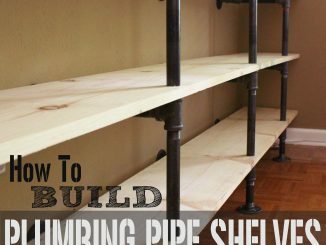 Full tutorial to building this beginners project. 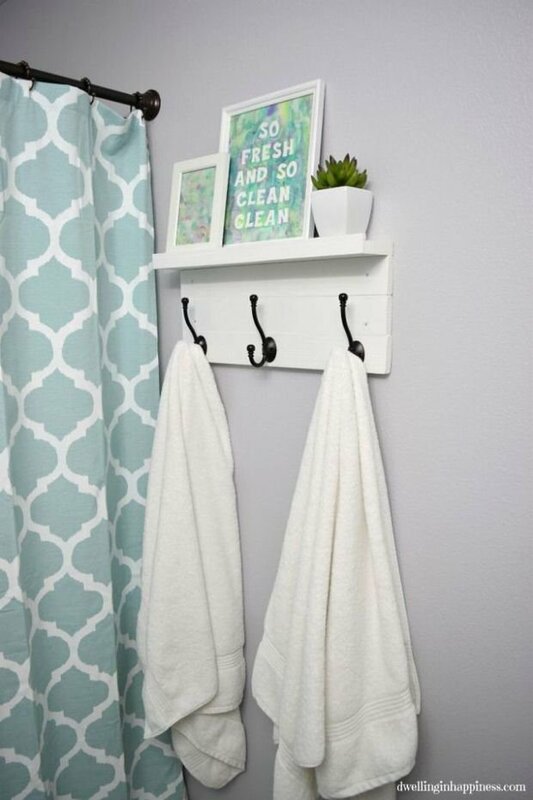 From ‘Dwelling in Happiness’, build this DIY towel rack with a shelf from scrap wood and some hooks. 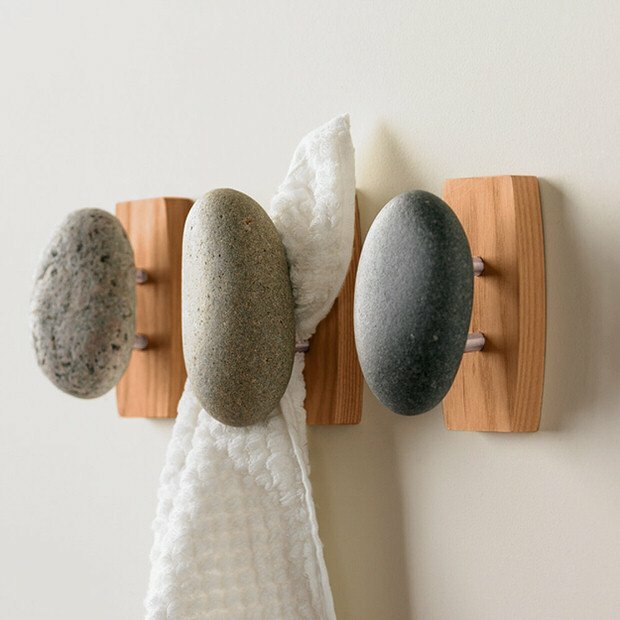 Another perfect project for beginners. Last, from ‘Strawberry Jam House’, Tara made this completely awesome towel rack from an old window. She walks you through how she did it, including some great tips for the “details”. Love the fabric backing!